• The Hollywood Reporter tells what it calls “the uncensored, epic, never-told story behind Mad Men,” quoting Matthew Weiner, the show’s cast and crew and several AMC and Lionsgate TV executives. The Hollywood Reporter also features exclusive portraits of the cast. • John Slattery discloses to Vulture an unaired Mad Men scene, between Roger and Mona (played by Talia Balsam, Slattery’s real-life wife) in Season 1, that he wishes had aired. • Gothamist discovers the 10 films that Mad Men‘s cast and crew were required to watch. 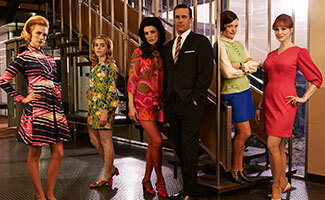 • RadioTimes chooses Mad Men‘s “beguiling” opening credits as one of the best on TV. • In a Mad Men tribute video at The Wall Street Journal, Sarah Silverman talks about turning down Jon Hamm’s suggestion to audition for the part of Rachel Menken. • Entertainment Weekly spotlights the trailer for Dark Places, a movie based on a Gillian Flynn novel that features Christina Hendricks and opens in France on April 8. • Deadline reports that Kiernan Shipka has joined the English voice cast for When Marnie Was There, which will be released May 22 in New York and Los Angeles and expand to all major markets in the following weeks.